Heamar's newly formed partnership with Laselec means that we can now offer laser wire marking systems such as the MRO 200 series. This range of laser wire marking machines are designed for small to medium-sized production runs and one-off jobs. 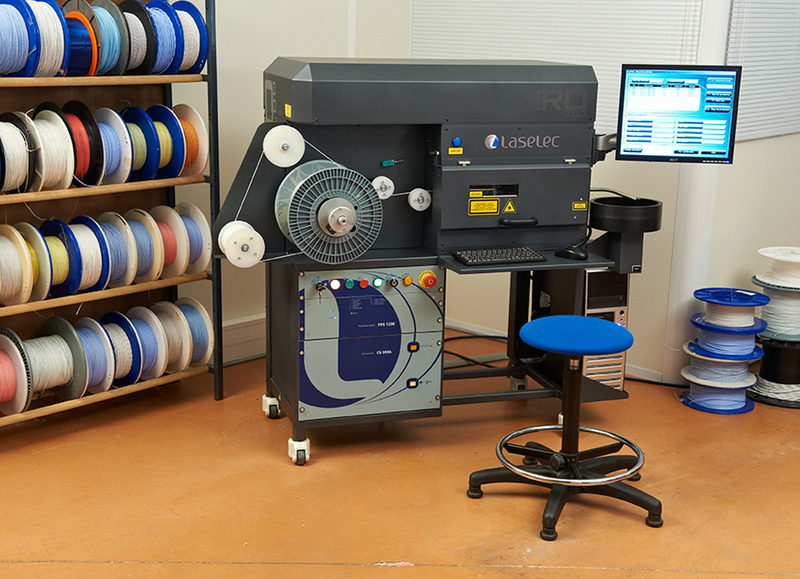 These high-tech UV laser wire marking machines for harness manufacturing are affordable and available to everyone thanks to the efficient and compact nature of the MRO 200 series. The MRO 200 series allows you to optimise production thanks to its exclusive machine features. They combine the use of a proven reliable mechanical design with the state-of-the-art purpose-built laser vector marking technology. With no mask and no water cooling, this solution offers many advantages such as reduced maintenance, low operating costs and low noise level and power consumption. Heamar believes this series satisfies the needs of maintenance, repair and overhaul centres for aircraft in order to ensure maximum ROI. The MRO 200-A can also serve as a rework machine alongside the ULYS Modena machines in a manufacturing setting. Heamar recommends this machines to various production workshops with modest output who are keen to adopt a secure, efficient and innovative marking method. The MRO 200-A is ideal for a user who wants to control production costs. As well as the machine's ease of use and quality construction, Heamar also offer this machine at a highly competitive price. Low operating costs; no daily consumables. Reduced maintenance with no daily attention necessary and high reliability. User-friendly operating controls and automated control systems. Tele-maintenance kit utilised for remote diagnostics and maintenance. A solid and reliable cable handling and cutting system that guarantees the integrity of the wire insulation. Simple and quick spool changing for wire from 6-26 AWG. An extremely stable, high-performance laser marker. An innovated and safe form of technology. Designed for low to medium production needs, maintenance repair, and overhaul. 355nm frequency-triples Nf-YAG solid-state laser-Class 1. Produces a durable and high contrast mark that cannot be matched. Handles all UV-markable single-core wires and jacketed multi-core cables. Can handle cable lengths from 15cm to 999m (6 inches to 3,277 feet). Auto-calibration and self-adjustment of the laser. Real-time energy level control (for contrast) with automatic adjustments to desired specifications. Data acquisition by manual entry, USB key, hard drive or plant network. Automatic wire tensioning and cutting system compliant with aviation industry standards. System control via IBM-compatible PC including Windows 7. Compact, ergonomic structure mounted on casters. User safety hood complying with laser safety regulations. The MRO 200 marking machines have been approved and qualified by Boeing as per BAC 5152 and by Airbus and per AIPS and they confirm to international aeronautical standards such as SAE ARP 5607 and are currently the only machines on the market that can offer inverted marked at the cable ends. They have also been qualified and approved by the major aircraft manufacturers and they are used in civil and military programs worldwide, including Leonardo Helicopters, Airbus, ATR, Bell Helicopter, Boeing, Bombardier/Learjet, Dassault, Eclipse, Embraer, Airbus Helicopters, Gulfstream Aerospace, HAL, Lockheed Martin, MIG, Raytheon, etc. BCAircraft: "Thanks to the MRO 200-A we removed manual cutting and sleeves. We cut and mark the cables directly by laser. We have increased our productivity by 25%."